Ashvatthama (Sanskrit: अश्वत्थामा, Aśvatthāmā) or Ashvatthaman (Sanskrit: अश्वत्थामन्, Aśvatthāman) or Drauni is the son of guru Drona and the grandson of the sage Bharadwaja. Ashvatthama is a mighty Maharathi who fought on the Kaurava side against the Pandavas in the Kurukshetra War. Ashvatthama is considered as avatar of one of the eleven Rudras and one of the seven Chiranjivi. Along with his maternal uncle Kripa, Ashvatthama is believed to be a living survivor of the Kurukshetra War. The deceptive plot of his rumoured 'death' led to the beheading of his grieving father Drona, who was incapacitated while meditating for his son's Ātman. Ashvatthama was appointed as the final commander-in-chief of the Kauravas in the Kurukshetra War. Ashvatthama, overcome with grief and rage, manifests his latent powers as a Rudras. He slaughters most of the Pandava camp in a single night offensive. When Arjuna defeated Drupada of Panchala, Drona declared Ashvatthama to be the new king of Panchala. According to The Mahabharata, Ashvatthama means "the horse-voiced". It is so called because when he was born he cried like a horse. Ashvatthama was the son of Dronacharya and Kripi. Drona did many years of severe penance to please Lord Shiva in order to obtain a son who possesses the same valiance as Lord Shiva. Born a Chiranjivi, Ashvatthama was born with a gem in his forehead which gives him power over all living beings lower than humans; it protected him from hunger, thirst, and fatigue. Though an expert in warfare, Dronacharya lived the simple life of a Brahmin, with little money or property. As a result, Ashvatthama had a difficult childhood, with his family unable to even afford milk. Wanting to provide a better life for his family, Drona goes to the Panchal Kingdom to seek aid from his former classmate and friend, King Drupada. However, Drupada rebukes the friendship, claiming a king and a beggar cannot be friends, humiliating Drona. After this incident, and seeing the plight of Drona, Kripacharya, invited Drona to Hastinapur. There, he came upon the attention of his co-disciple Bhishma. Thus, Dronacharya became the guru of the Pandavas and of the Kauravas in Hastinapur. Ashvatthama was trained in the art of warfare along with them. Ashvatthama is a notable figure in the war and engages in many battles, though not scoring any significant kills until after his father's death. On the 14th day of the war, he killed an Akshuhani of Rakshasa and when Anjanaparvan created illusions he penetrated it by Vajra and Vayavya Astra. He also killed Anjanaparvan and defeated Ghatotkacha several times by achieving feats of deflecting their celestial weapons at themselves. He also stood against Arjuna several times on equal footing but was eventually defeated by the latter. On the 10th day of the war, after Bhishma falls, and Drona is named the supreme commander of the armies. He promises Duryodhana that he will capture Yudhishthira, but then he repeatedly fails to do so. Duryodhana taunts and insults him, which greatly angers Ashvatthama, causing friction between Ashvatthama and Duryodhana. Krishna knew that it was not possible to defeat an armed Drona. So, Krishna suggested to Yudhishthira and the other Pandavas, if Drona were convinced that his son was killed on the battlefield, then his grief would leave him vulnerable to attack. Krishna hatched a plan for Bhima to kill an elephant by the name Ashvatthama while claiming to Drona it was Drona's son who was dead. Ultimately, the gambit works (though the details of it vary depending on the version of the Mahabharata), and Dhristadyumna beheads the grieving sage. According to the Chaturdhar compilation, the Narayana Astra destroyed one Akshauhini of Pandava army completely. After the use of Narayana Astra, a terrible war between both armies took place. Ashvatthama defeated Dhrishtadyumna in direct combat, but failed to kill him as Satyaki and Bhima covered his retreat. Terrible war took place between the warriors of both sides as Ashvatthama forced both Satyaki and Bhima to withdraw. In his fury, Ashvatthama manages to kill King Nila of Mahismati. After the death of Dushasana, Ashvatthama still suggested Duryodhana that he make peace with the Pandavas, keeping in mind the welfare of Hastinapur but he refused. Later, after Duryodhana is struck down by Bhima and facing death, the last three survivors from the Kaurava side, Ashvatthama, Kripa and Kritvarma rush to his side. Ashvatthama swears to bring Duryodhana revenge, and Duryodhana appoints him as the commander-in-chief. Hearing of Duryodhana's fall, he went to meet him and promised him to despatch all the Panchalas, to the abode of Yama. Along with Kripa and Kritavarman he planned to attack the Pandavas camp at night. Ashvatthama first kicked and woke up Dhrishtadyumna, the commander of the Pandava army and the killer of his father Drona. Ashvatthama strangled the half-awake Dhrishtadyumna by choking him to death as the Panchal prince begged to be allowed to die with a sword in his hand. Ashvatthama proceeds with slaughtering the remaining warriors cutting their limbs off and tearing them in two via his sword, including Shikhandi, Yudhamanyu, Uttamaujas, and many other prominent warriors of the Pandava army, he remained unharmed despite all of their combined attacks due to awakening his abilities as one of the 11 Rudras, followers of Shiva. Those who tried to flee from Ashvatthama's wrath were hacked down by Kripacharya and Kritavarma at the camp's entrance and those who remained were slaughtered by berserker. After the slaughter, the three warriors go to find Duryodhana. They find Duryodhana already dead and, mourning, they perform the cremation rites. The Pandavas and Krishna who were away during night, now returned to their camp the next day morning. Hearing the news of these events in the morning Yudhishthira fainted and the Pandavas become inconsolable. Bhima angrily on hearing this rushed for killing Drona son. The Pandavas, along with Krishna, went to save Bhima. They found him to sage Vyasa's ashram near the bank of Bhagiratha. The now triggered Ashvatthama invokes the Brahmashirastra against the Pandavas to fulfill the oath of killing them which he had given to Duryodhana. Krishna asks Arjuna to fire the Brahmashirastra against Ashvatthama to defend themselves. Sage Ved vyas intervenes and prevents the 2 weapons from clashing against each other. He asks both Arjuna and Ashvatthama to take their weapons back. Arjuna, knowing how to do so takes it back. 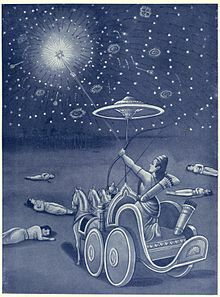 Out of rage, Ashvatthama instead directed the weapon towards the womb of the pregnant Uttara in an attempt to end the lineage of the Pandavas. The angered Pandavas wanted to kill Ashvatthama, but Sage Vyasa reminded them of the deceitful tactics they had used against the Kauravas. As a punishment, Ashvatthama was asked by Vyasa to surrender the gem on his forehead to Pandavas for his forgiveness. Krishna then cursed Ashvatthama that he will roam in the forests with blood and puss oozing out of his injuries and cry for death for 3000 years. Since he had no fear of death during war, death would not meet him. Ashwathama,is a prominent figure in Hindu mythology. He is one of the Chiranjivi. Wikimedia Commons has media related to Ashwatthama.